One of the reasons I started my blog was to share the joy and inspirations behind my art with others. 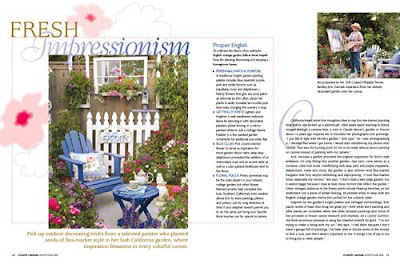 Part of the joy of creating is sharing and what a delight for me to have the honor of sharing my personal California garden and flea-market style, which serves as the inspiration for my art, in the March 2009 Home Tour Edition of Country Sampler magazine. 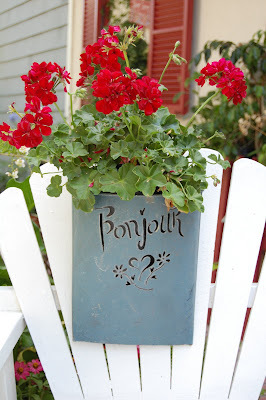 The beautifully written article by Elizabeth Preston, Associate Editor, shares seven pages with ideas on "cultivating the charm of an authentic English cottage garden, bright ideas for using flea market finds and mirrors and tips on designing a mini Provencal style garden". 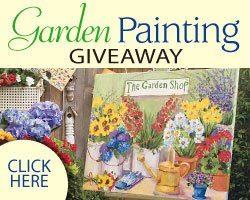 One page shows the inspiration behind the garden painting on my blog banner (which I donated as a give away to the readers). 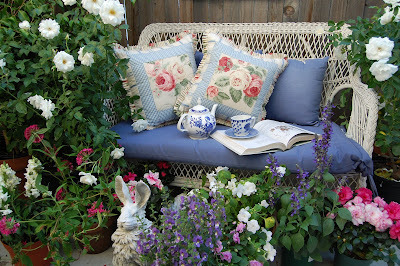 Sunday Hendrickson, fabulous stylist, really made my garden sing and Mark Lohman's photography is perfection. I am not usually at a loss for words, however, when I read the lovely article Elizabeth wrote about me and my garden all I could say was WOW, I am speechless. I donated one of the paintings in the magazine article as a give away for the readers. 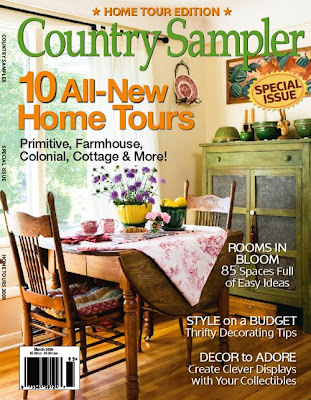 Directions on how to register can be found in the Home Tour Edition of Country Sampler, March 2009, or you can go on line to http://countrysamplermagazine.com/ and click on MAGAZINES - then click on HOME TOUR - then click on CONTESTS AND PROMOTIONS. And yes, there is a photo of my Studio Assistant, Bentley, in the article. 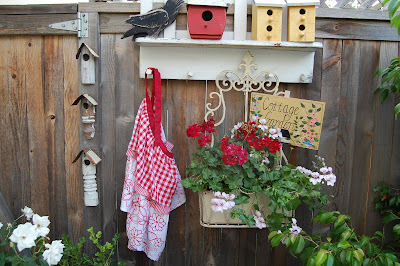 Below are a few of my personal photos showing a little taste of my garden and flea-market finds not shown in the magazine article. You can also see my blog friend Kim''s adorable Dear Daisy Cottage of the very popular Dear Daisy Cottage Blog, http://deardaisycottage.typepad.com/ in the magazine under "True COLORS". The article features eight pages of her adorable cottage with lots of ideas on "perfect your palette with sunny hues to get a carefree look that's fresh and fun". Kim's adorable pup Miss Maggie is also featured. Bentley and Maggie have become blog friends and Bentley is also wagging his tail in happiness that he and Maggie are in the same issue. 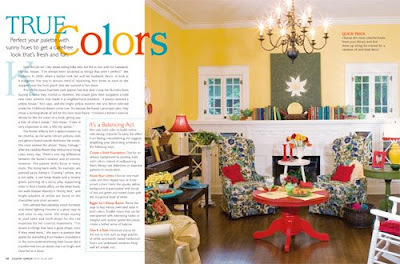 Congratulations to Kim and Country Sampler for the beautiful and colorful article on her Dear Daisy Cottage. Kim is a very talented decorator and writer who has a great eye for color and flea-market finds. . . as well as being a sweetheart. . .she took the time to give me words of encouragement to start my own blog. . her advise - just jump in and get started. Thank you Kim, I just dove in and love Blog Land. Oh Erin ~ you are SO sweet! Thank you so much for your kind words... you know how I feel about you and I am VERY happy that you are in Blogland!! Your beautiful Country Sampler feature is fantastic - very well done and you are SO deserving. Congratulations to YOU!! Thank you for all of the inspiration that you share with us. You are a treasure. you are so talented and its a treat to come here and enjoy all your style. congrats on the article, talent always rises to the top! Congrats to you both for being featured in such a lovely magazine. 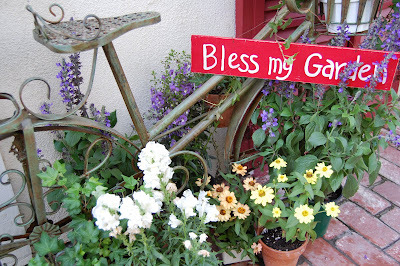 I'm not surprised they said such nice things...your garden is beyond beautiful. It is the kind of place that just by visiting it would take all your cares away. How wonderful! I am SO happy for you and feel like I am part of it all by being able to come here and see all of your beautiful photos and share the delight of your art. How proud I am of YOU! I can't wait to buy the magazine! My friends are featured in it...doesn't get any better than that! OH~~ I was so excited to see your new post that I went to get a fresh cup of coffee before I started to read it.I can't wait to buy this magazine and to read the article and look at your beautiful garden. What a special experience for you.OH and I must add I can't wait to enter for a chance to win one of your paintings. You are so talented not with just painted but with your garden as well. I'm glad time is going to change this week, as I will have more time to work in my ( so called garden) Thank-you so much for your inspiration,it's always nice to be inspired this time of year. Congratulations, Erin! You are such an inspiration and a wonderful talented artist. Wow - congratulations! I can't wait till I can buy the magazine and see both your story and Dear Daisy Cottage's. You have the kind of garden I am striving for and will probably never succeed at where I am now. I love your work so much! 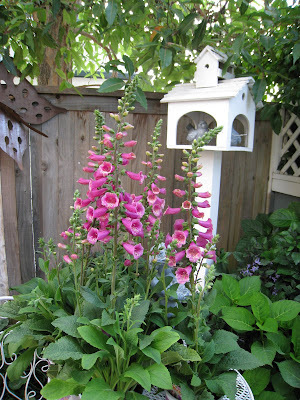 Erin, this is so wonderful..your home and garden look beautiful in the magazine. Many congratulations to you. I bought my copy yesterday and love your gardens. I wish they had printed more pictures! 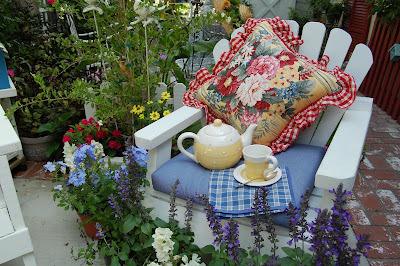 Wow - how fun your garden looks - can you tell us where you got the yellow table cloth. I wish we could see the inside of your house. Where did you get the picket fence? Such a good idea. I love all of the white in your garden. Wish we could see more. Soooo happy I stumbled across your blog !! You are so talented!! The Painted Garden has another big fan - PS: Bentley is adorable too, what a great studio associate!